A slow weekend is the best premise to explore something new. Some read a long forgotten book, a few settle down in front of the television but foodies like us; try new recipes. Like all other weekends the “Whats special for dinner?” question was just around the corner. We were eager to cook a rice recipe and having made Biryani, Fried Rice and Risotto infinite times, we were looking forward to tickle our taste buds with something different. Then we remembered Paella and it seemed to be a good choice as most of the ingredients are easily found in the modern Indian Kitchen. Paella (pronounced pah/EH/yah) widely regarded as Spain's national dish comes from the Valencia region, where the dish’s two most vital ingredients grow: rice and saffron. Both ingredients came to Spain through the 700-year Arabic occupation of Andalusia. It can be found in two main varieties, with chicken and rabbit or with seafood and some parts do a good vegetarian version too. Valencians firmly defend their ‘traditional’ combination of short grain white rice, green vegetables, meat (generally chicken and rabbit), beans and saffron against all ‘modern’ deviations with passionate regional pride. Valencians on the Mediterranean coast used seafood instead of meat and beans to make paella and this recipe is also considered authentic. Paella's popularity spread past Spain's borders during the 20th century. This resulted in the dish acquiring regional influences as different cultures tried making paella. 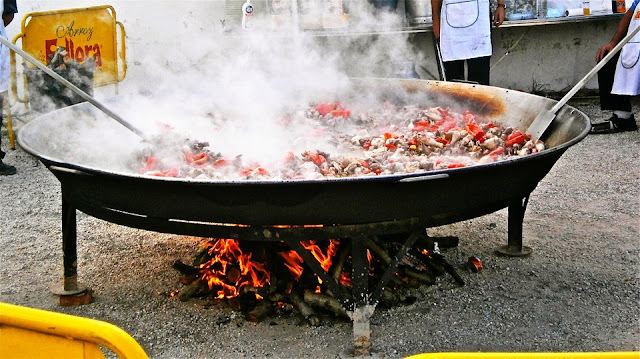 Consequently, paella recipes went from being relatively simple to including a wide variety of seafood, meat, sausage, (even chorizo) vegetables and many different seasonings. However, globally seafood paella recipe is most popular. 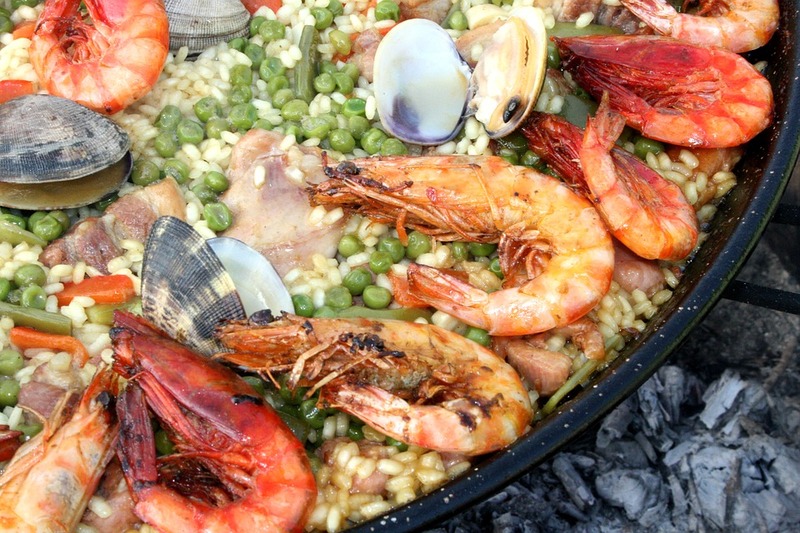 Throughout Non-Valencian Spain, mixed paella is very popular. Some restaurants in Spain that serve this mixed version refer to it as Valencian paella. However, Valencians consider only the two original Valencian recipes as authentic. A valuable Spanish edict: “Cuantos mas seremos, mas reiremos” which means the more we will be, the more we will laugh. 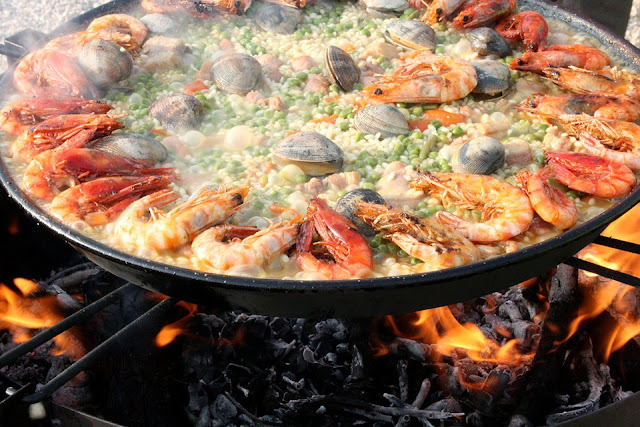 Paella is a community food and associated with fun and fiesta. Sharing paella serves as a generous means of strengthening your connection with folks at work or a community group gathering. Traditionally in Valencia, paella is cooked over an open fire, fueled by orange and pine branches along with pine cones. The aromatic smoke from the fire infuses the paella. Also, guests traditionally eat directly out of the paellera (a round flat pan with two handles). After cooking paella, there is usually a layer of toasted rice at the bottom of the pan, called socarrat in Spain. This is considered a delicacy among Spaniards and is essential to a good paella. March 27th is National Paella Day. Believe it or not, people do try to set paella records throughout various regions of the world, aiming to make the world’s largest paella. Cut the squid into small pieces. Lightly pan fry the prawns and reserve. Using the same oil, fry the garlic and the finely chopped onion. In another pan, pan fry the artichokes over high heat and season. Add to the pan with the onions. Repeat the process with the green pepper and then with the red one. Then add the skinless and seedless tomatoes. Once the tomatoes are cooked, add the squid and cook until they soften and then add rice. Pour the hot fish stock equally all over because the rice will not be stirred after. Season, add the prawns, langoustine, mussels and clams. Put in the oven for 13-14 minutes take out and leave to rest for 10 min before serving. Chop onion finely,dice the green pepper, quarter the mushrooms and the artichoke. Do a mirepoix (roughly chopped) of courgette, carrot and aubergine. Cut the french beans and asparagus in half. Sweat the onions and garlic, then add carrots, green pepper, mushrooms, courgette and aubergine in this order and finish with the tomato sauce. Reserve the french beans, the artichoke and the asparagus. Put in an oven-proof pan- pan fried vegetables, add rice and stir, cover with the vegetable stock, two and a half time the quantity of rice. Top with the french beans, artichokes and asparagus, and bring to the boil, add salt and put in the oven for 15 to 20 min, take out and leave to rest for 10 min before serving.